The elegant farm buildings of the estate date back to the 17th century. What used to be granaries, storerooms and living quarters of the employees have now been turned into comfortable and well-equipped apartments. The apartments are located within the tower of the main farm building. This entails two flights of stairs. All four are composed of a single studio flooded with light by 2 or 3 large windows, which look out either onto the historical park of the estate or the courtyard articulated by a series of classical columns. Each room consists of a living-dining room with kitchenette and adjoining bathroom. 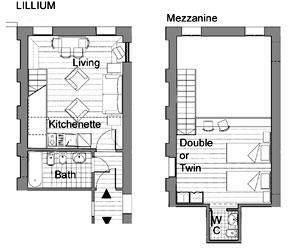 The bedrooms (double or singles, as per request) are located on the mezzanine, with adjoining second WC – except for Silene, which only has one bathroom. The sofa in each apartment can be transformed into two single beds. The apartment has WIFI internet access. Most attractive feature of the building is the courtyard with its columns and loggia, and profusion of geraniums and lemon trees in antique terracotta vases. Tables and chairs will invite you to spend some time here, reading-up your guide books while having breakfast or relaxing with a glass of the excellent local red wine after a rewarding day of sight-seeing. The pool lies within the estate next to the golf clubhouse, approx. 1 km from Torretta. The wine cellar on the other side of the Toretta is now a reception room, which is rented out for weddings or other festivities. Our guests have not been bothered by either, but you should however be aware of the other activities on the premises. Flower filled courtyard with table and chairs, shared with the other tenants. The pool lies whitin the estate next to the golf clubhouse, approx. 1 km from Torretta. Size 10×20 m.